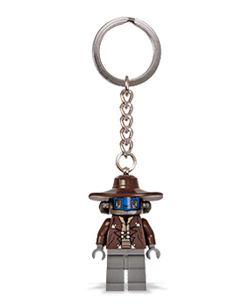 853127 Cad Bane Key Chain is a Star Wars Key Chain, featuring Cad Bane. It was released in March 2011. Cad Bane was a Duros bounty hunter seen during the Clone Wars, involved in combat against the Jedi and Clones. He was one of the best Bounty Hunters in the Galaxy and was known to have killed many Clone Troopers. Bane was hired by Darth Sidious to steal a holocron from the Jedi temple. he was then pursed by Anakin Skywalker but escaped. He then ran into Anakin Skywalker again and this time he was captured. He then escaped but lost the Holocron to Obi-Wan Kenobi and Mace Windu. He was later hired by Jabba the Hutt to get the plans for the Senate Building from C-3PO and R2-D2. He then used the plans to hold the senate hostage, and with the help of Shahan Alama and Aurra Sing he freed Ziro the Hutt from prison. Bane was then sent to chase Ziro when he escaped from the Hutt's prison on Nal-Hutta. He found Ziro dead on Teth and then tried to kill Obi-Wan Kenobi and Quinlan Vos so that he could earn some money from the Separatists. He failed to kill the Jedi so he escaped from the Jungle planet. This is a description taken from LEGO.com. Please do not modify it. Navigate anywhere with Cad Bane™ by your side! Find your destination or a Jedi holocron with bounty hunter Cad Bane™ - straight from Star Wars™: The Clone Wars™! This vicious villain is the perfect addition to your key ring for stealthy getaways in any galaxy! Facts about "853127 Cad Bane Key Chain"
Navigate anywhere with Cad Bane™ by your side!